The man who scaled the White House fence and was able to run through the front doors made it farther into the building than was previously reported, CBS News has learned. Secret Service Director Julia Pierson is scheduled to answer questions about the incident when she appears at a hearing of the House Oversight and Government Reform Committee Tuesday morning. The man, 42-year-old Omar J. Gonzalez, ran unobstructed for 70 yards across the front lawn of the White House before entering through the North Portico. On the way, he brushed by a Secret Service officer with a drawn gun, sources tell CBS News' Bill Plante. Gonzalez then proceeded to run through the entrance hall to the cross hall of the White House, past the staircase that leads up to the first family's residence. He was confronted by a female Secret Service agent, who he overpowered, and made it all the way to the East Room, Rep. Jason Chaffetz, R-Utah, told CBS News, citing whistleblowers. Gonzalez was brought down by a door leading to the Green Room, a parlor adjacent to the East Room, which is used for formal events including bill signings, press conferences, receptions and ceremonies. Previously, it was reported that Gonzalez only made it through the north doors of the White House - which were apparently unlocked - before being apprehended by the Secret Service. The agency declined to comment, citing an ongoing investigation into the incident. The White House says the results of the review will "further enhance" security. "He had just gotten inside the door [of the North Portico] . . . And was then wrestled to the ground by one of the Secret Service personnel . . . in the foyer," former Secret Service Director W. Ralph Basham, told CBS News, explaining his understanding of the apprehension. Basham spoke with current director, Pierson, as recently as this weekend. Basham said that he believed "as soon as the individual got in the door . . . he was apprehended by one person." The major security breach occurred Sept. 19, just minutes after President Obama, his daughters and one of their friends boarded the presidential helicopter for a weekend getaway to Camp David, the presidential retreat in Maryland. The first lady had traveled there separately. 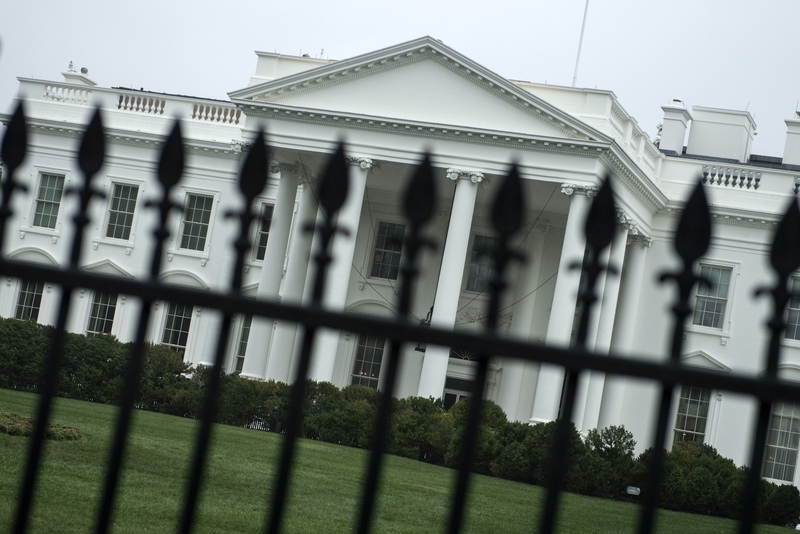 It prompted the Secret Service to erect a second fence about 12 feet further away from the White House than the permanent fence, creating second barrier that would-be fence jumpers would have to climb. Officials originally argued the reason agents didn't shoot the suspect, Omar Gonzalez, as he sprinted across the lawn or release guard dogs to detain him was because he appeared unarmed. In fact, he was found carrying a two-and-a-half inch folding knife with a serrated blade and his car reportedly contained 800 rounds of ammunition. The revelations will only heighten concerns about an agency that has had several high-profile security failures in recent years. On Sunday, the Washington Post reported that it took agents four days to realize a man had fired bullets that struck the White House in 2011. Members of the House Oversight and Government Reform Committee are set to grill Secret Service Director Julia Pierson Tuesday during a hearing that was first called after Gonzalez jumped the fence and entered the building. "I don't see people being held accountable and I don't see changes that make the security situation better, so part of [the hearing] is to discuss the perimeter at the White House but I think the problems are much deeper seated than that," Chaffetz, a member of the committee, told CBS News Sunday. "There are other incidents that we might talk about but we're also going to reach back during her tenure to review what has happened and not happened." In a separate interview, House Oversight and Government Reform Committee Chairman Darrell Issa, R-California, told CBS News that it will be very difficult for the American people to trust the agency after the last incident. "There is nothing that can be said public that's going to cause the American people to have confidence after the Secret Service failed to lock the front door as part of its protection of the White House," he said.